Introducing, originally uploaded by annamariahorner. It's out now, folks, and I confess that I did buy some of it. And since I've placed my order already, I can spread the word that Quilthome is offering 25% off AMH (including Innocent Crush) until October 3. Run! Run now! Backlit diamonds, originally uploaded by Shadrach Meshach & Abednego. I know I've been gone awhile - it's been an utter madhouse this September here in my corner of the university. I haven't opened up my machine in the last two weeks - the longest hiatus in a year! But I have an immense amount of teaching in the month of September, before our students go off on practicum. At the end of the month (next week! ), things settle down to my normal level of teaching responsibilities, so I'll be able to return to more regular posting. However, although my machine hasn't been out, I've been beetling away at the handpiecing that I started last month. What I am showing is the net effect of about 30 days of using the Quilt Patis diamonds. 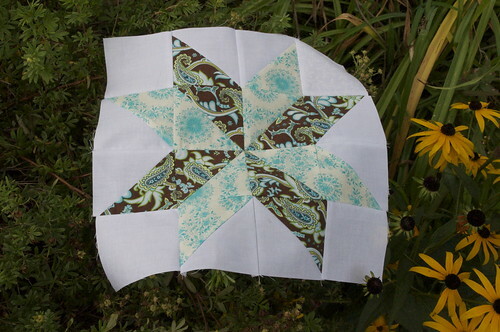 I've got a trapezoid that I keep adding to star by star. I don't have a good sense of how to shape it. Eventually it will get to a size that means it's time to stop. At some point before that, I have to shape it into a generally square or rectangular shape. Let's hope that I have an epiphany along the way about how to accomplish that. In the meantime, the trapezoid gets bigger and bigger! First, my blogiversary was September 18! It's a shame that I was too busy to organize a celebration that coincided with the actual date, but there will be a belated birthday party, with at least a couple of loot bags. Second, I want to thank my LQS for picking me for the $100 grand prize from their fall open house draw!!! Yay! Any suggestions for what I should get? 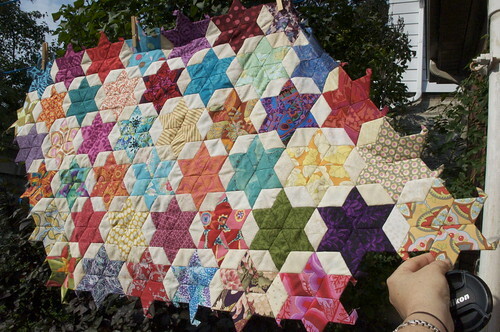 Third, my next quilting endeavour involves kaleidoscope blocks. I'm going to make a serious study of them, and I've equipped myself with two different rulers, both of which allege they make life much simpler. I'm in favour! So stay tuned. Finally, does anyone have any experience with Quiltsmart or Inklingo products? I would love to hear your opinion. 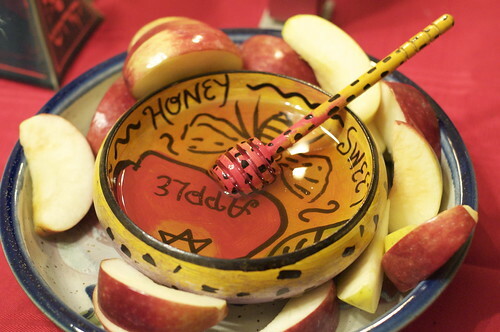 Shanah tovah umetukah!, originally uploaded by Shadrach Meshach & Abednego. 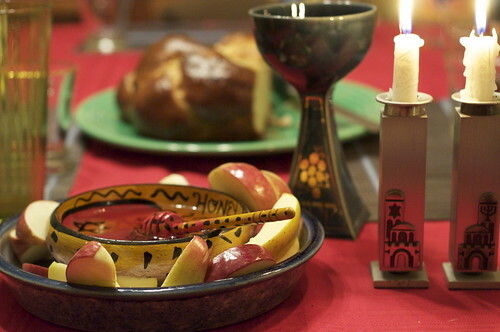 Tonight Jews around the world celebrate the New Year - 5771 - and we pray to be inscribed and sealed in the Book of Life. May we all have a healthy, happy and prosperous year and continue to strive to make life better for those around us. Dee's August Block for ISQB, originally uploaded by Shadrach Meshach & Abednego. 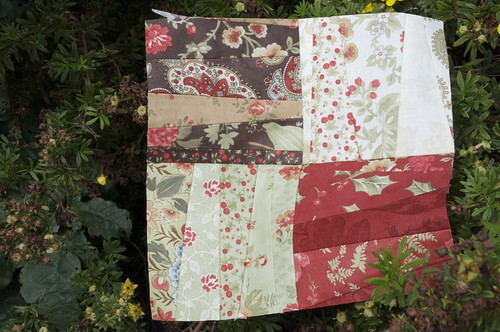 I've been blogging for about as long as I have been quilting in the 21st century - just about a year. 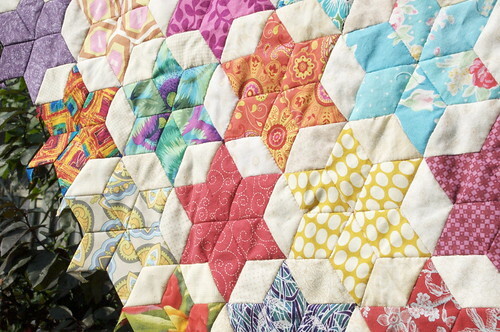 And going along with that is the whole quilting-oriented internet activity, such as reading blogs, following online tutorials and shopping for fabric. It has been interesting to see when the big sales hit. In Canada, Boxing Day is a big sale milestone. Not so much in the U.S. There are loads of online fabric sales on the Friday after Thanksgiving. And to my surprise there have been quite a few fabric sales associated with Labour Day. All this to say that I did a bit of fabric acquisition activity over the last few days. In particular, I couldn't resist Farmdale. So far from my usual taste, but I had such a craving! I have a teaching load that is unbelievably intense this month, so I tried to take a bit of time to bring myself up to date with my bee sewing. 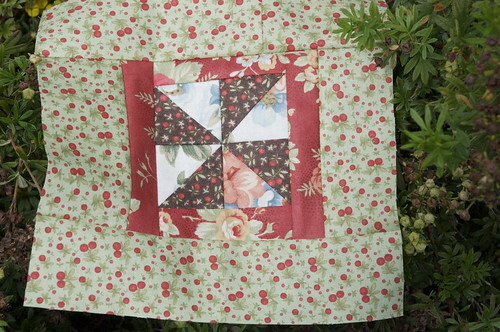 The photo at the top of the page is for Dee, in the Incredible Shrinking Quilters' Bee. The two below are for Sharon, in the Maple Leaf Bee. She sent us a bunch of odds and ends, mainly Glace, and declared it quilter's choice. I had a charm pack of Glace that I plundered to add a bit more fabric to the pool. Hope these are in the ball park of what she was wanting! This one is for Rebecca of the Modern Tradition Bee. 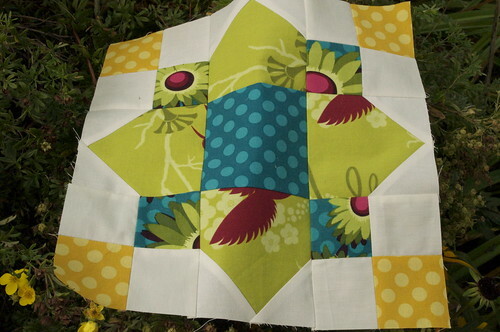 If I had had more fabric, I would have fussy cut to add a bit more contrast to the squares surrounding the centre square. But I had to work with what I had - so the block is a bit lower contrast than ideal, but I still like it. I do like that Patty Young fabric line! The weather has been so hot and humid these last two days, and we have no air conditioning in the main part of our house. So this is the context and probably partly responsible for the cranky tone of this post. Why am I cranked? Let me tell you. 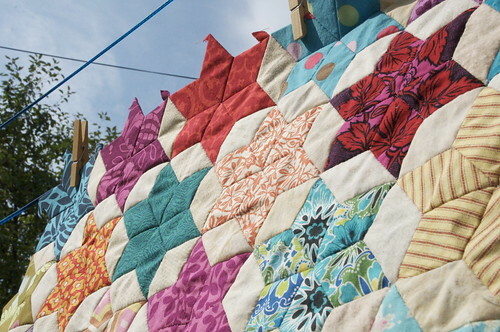 I just read about the Modern Quilt Guild challenge that has just launched. It sounds awfully exciting. 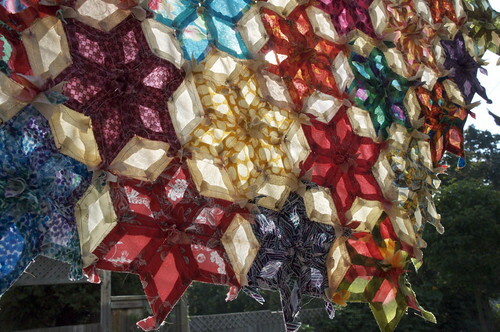 You have to submit a photo of your inspiration for the 45" quilt that you make, plus a write-up about how the inspiration object shaped the vision of the quilt. And there are tons and tons of prizes, including a Janome machine, loads of loot from C&T Publishers, a whack of batting, a whack of fabric, etc. In their previous communications about the upcoming challenge, they assured readers that international participants were welcome. But in today's post, they have reneged on this, and international participants are not eligible for prizes. "We are truly sorry about the international situation. We wish it were different but in doing research about contest laws we realized that they are different in every country and we can’t accommodate all of them. We were genuinely disappointed to learn this was the case, and we wish it were different. We in no way intended to exclude non-US residents but there was just no way around the legality of it. Our apologies for speaking too soon about it previously." I'm ticked off, too. Not because I think I'm so great that I would win a prize, but because I just get fed up with the perpetual two-tiered system. Canadians (and Australians, Brits, French, etc), you're welcome to come and play, but not really. Oh, come on, don't be a bad sport, don't you want to join in just for the fun of it? Well, sure we would, if everyone else would, too. Would Americans not play if there were no prizes? If the game is only worth it for the prizes, then it's not much of a game. It's not much of a community, either.